Utah Moto Trails - Dirt Bike and ATV Trails: Poison Spider Dirt Bike Trail Report Moab Utah. Poison Spider Dirt Bike Trail Report Moab Utah. 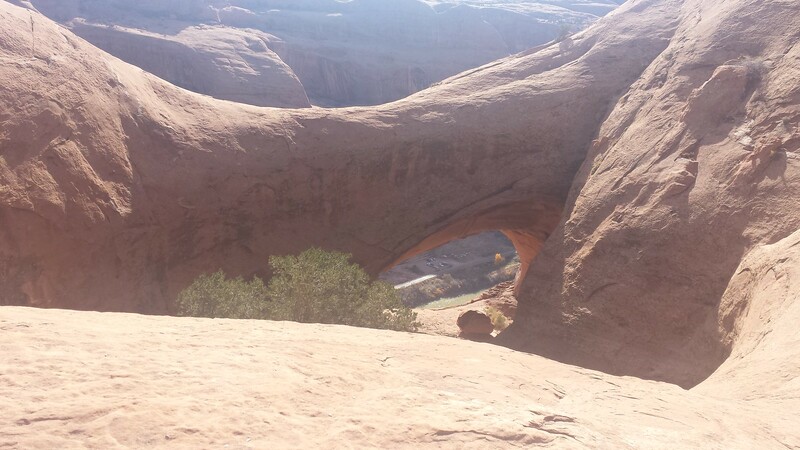 The Poison Spider Trail in Moab is one of the “must do” trails in the area. It’s not overly difficult and yet maintains a good tempo and doesn’t get too boring with a good amount of obstacles to entertain. You will see others on this trail as it is popular with jeeps and mountain bikers as well as dirt bikers. Little Arch, people ride across this! We travelled about 20 miles(mapped in red below) and were on the trail for just over 2 ½ hours with a short stop at Little Arch and the Overlook. This ride could easily be extended however to include Golden Spike, Rusty Nail, and others. The trail is marked with white dashes on the slickrock and is easy to follow but with the many spurs and trails merging it is easy to get sidetracked as well. The benefit of being on a dirt bike is that covering ground is relatively easy and getting sidetracked isn’t necessarily a bad thing. All the trails in this area are good and with major landmarks such as the river, Gold Bar Rim, Jeep Arch, etc. it’s hard to get lost for too long. This trail is rated a 3+ on the redrock jeepers scale, so it is difficult but not too extreme and many can be made easier or harder with good line choices as desired. Riders with less experience will need assistance on some of the obstacles. The scenery in this area is really second to none, as is the case on most of the trails around Moab. Visiting Little Arch is fun and some actually ride across this on dirt bikes! We opted to not try as the consequences o f a mistake could be severe. As you can see by the picture, it’s a long ways down! The overlook is also worth a visit and makes for a nice break as well. Difficulty: Medium Difficulty, 3+ on redrock jeepers scale, 4+ being the hardest. Type: Double Track and Jeep Trail consisting mostly of slickrock with some sandy sections. or click for Directions To Trail Head from your location.